Following the destruction of the eye sore Embarcadero Freeway, remodeling of the Ferry Plaza was completed in 2000. Prior to construction of the Golden Gate Bridge in 1937, the Ferry Building was the singular symbol of San Francisco. With its busy piers and endless streams of streetcars, taxis, pedestrians, jitneys, trailers, lumber carriers and trucks, this was once known as the heart of the noisiest main street in America. At its peak before train service across the Bay Bridge, more than 50 million ferry passengers came through the plaza each year. By comparison, Oakland, San Francisco, and San Jose's airports collectively served 53 million passengers in 1998. Today's Ferry Plaza includes loads of open space, palm trees, the vintage F Line streetcars, and two art deco lamps that blast spires of light into the night sky. Within a year of opening to the public the new, $50 million Ferry Plaza became a popular site for homeless campers and squatters attracted to its waterfront views and safe location near the financial district. 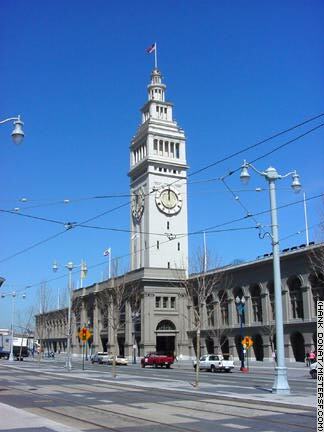 Earthquake retrofitting and renovation of the Ferry Building itself came next and was completed in 2003. The famous clock tower was patterned after the Giralda Tower of Spain's Cathedral of Seville.